According to a new market report published by Transparency Market Research titled ‘Fencing Market (Product Type - Privacy Fencing, Picket Fencing, and Others); (Material Type – Metal, Wood, and Plastic & Composite); (End-use – Residential, Commercial, and Agriculture)) – Global Industry Analysis, Size, Share, Growth, Trends, and Forecast, 2019 – 2027, the global fencing market is expected to reach US$ 62,766.5 Mn by 2027, expanding at a CAGR of 3.6% from 2019 to 2027. In terms of volume, the global fencing market is expected to reach 3,901.7 Million Feet, expanding at a CAGR of 2.2% from 2019 to 2027. The market is segmented by regions into North America, Europe, Asia Pacific, Middle East & Africa (MEA), and South America. Fencing is a part of the global perimeter security market. The perimeter security market in North America is a mature market and is growing at a healthy rate. In North America, rise in demand for perimeter security products are driving the demand for fencing products. Consumers in North America are increasingly demanding decorative home products, which is increasing the demand for ornamental iron and steel fences in the region. In North America, privacy fences hold the largest market share and are expected to grow in market size during the forecast period. Across North America, there are specific rules and regulations regarding quality of the material used to make fences. Fences made of metal such as aluminum, steel, wrought iron, etc. hold the largest share in North America. Presently, plastic and composite fences such as fences made of vinyl are increasing in popularity in North America and are expected to see rising demand during the forecast period. In North America, the U.S. is the dominant fencing market, followed by Canada. The perimeter security market in Europe is a mature market and growing. In Europe, rise in overall demand for perimeter security products are increasing demand for fencing products. Increase in demand for attractive home protection products are leading to rise in demand for fences in Europe. Privacy fences hold the largest market share in Europe and are expected to hold a share of 44.0% by the end of the forecast period. In Europe, market players operating in the fence market have to follow specific rules and regulations. In Europe, metal fencing holds a major share of the market. Ornamental iron and wrought iron fences are increasing in popularity as they have low maintenance cost. Fences made of plastics and composites such as PVC are also popular in Europe. France, Germany, and the U.K. are the major fencing markets in the region. The Asia Pacific perimeter security market is a growing market. In Asia Pacific, increasing usage of perimeter security products is increasing the demand for fencing products. Privacy fences hold the largest market share in Asia Pacific and are expected to hold a share of 43.0% by the end of the forecast period. Picket fences, chain linked fences, etc. are also growing in demand. In Asia Pacific, metal fencing holds a major share in the market. Wrought iron, ornamental iron, steel, and aluminum fences are increasing in popularity as they have low maintenance cost. Fences made of PVC are seeing increasing demand in Asia Pacific. China, Japan, and India are the major fencing market in the region. Demand for fencing products is growing in MEA with rise in perimeter security products. GCC and South Africa are the major fencing markets in the region. The perimeter security market in South America is small compared to other regions. Demand for fencing products is rising in South America with enhanced use of perimeter security products. Brazil is the largest fencing market in the region. In Rest of South America, Argentina is a major fencing market. The study provides a conclusive view of the global fencing market by segmenting it in terms of product type, material type, and end-use. In terms of product type, the global fencing market has been classified into privacy fencing, picket fencing, and others. The others category includes pool fencing, pet fencing, semi-privacy fencing, rail fencing, chain linked fence, etc. In terms of material type, the global fencing market has been segmented into metal, wood, and plastic & composite. In terms of end-use, the market is segmented into residential, commercial, and agriculture. 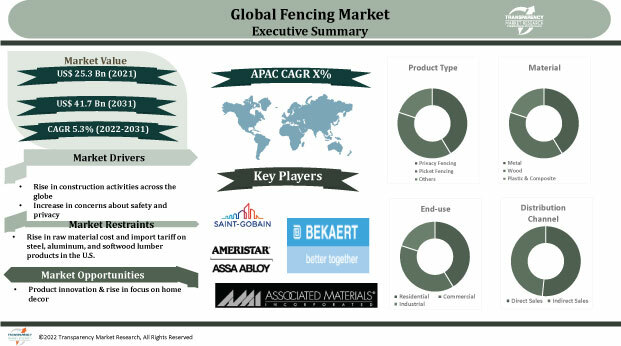 The report highlights major companies operating in the global fencing market including Compagnie de Saint-Gobain S.A., Bekaert, Ameristar Perimeter Security, Associated Materials, LLC., Jerith Manufacturing LLC., Long Fence Company Inc., Gregory Industries, Inc., Betafence Group, Ply Gem Holding Inc., and Builders Fence Company (BFC), Inc.